Publish or Perish can also be used to analyse the development of the literature on any particular topic over time. You can search for particular key words and look at how the number of papers published varies over time. In order to eliminate a potentially large range of irrelevant results it might be a good idea to focus on a small set of journals. 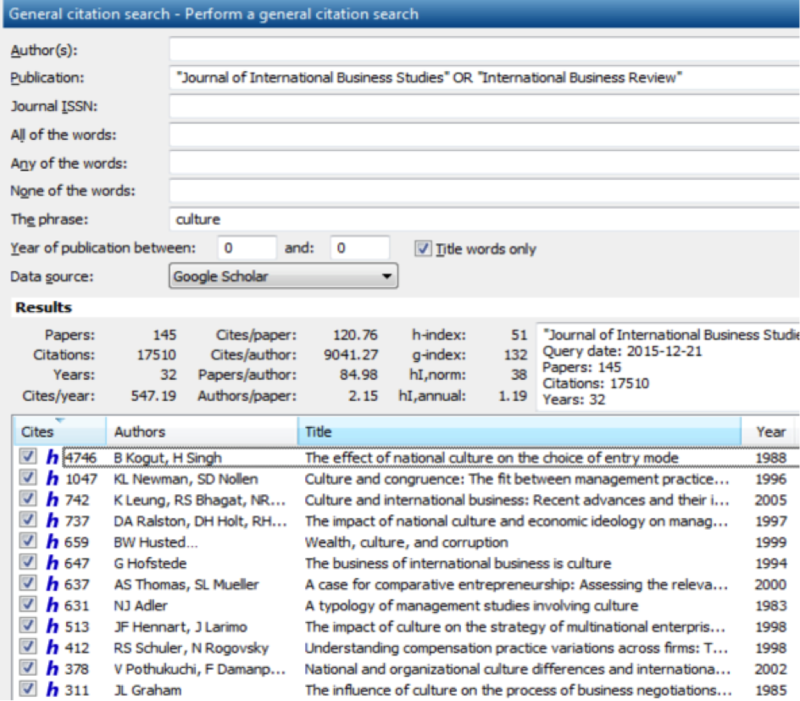 Journals can be combined with the OR function in the publication field, although Google Scholar generally ignores any journals beyond the second or third. Publish or Perish does not yet provide the ability to further analyse for instance the number of publications per year. However, exporting the data to a spreadsheet or statistical program allows you to do this very easily. In addition, by selecting all publications in a year, clicking “unselect” and looking at the reduction in the number of papers, you can easily establish the number of papers per year. Let us assume you are interested how research into the role of national culture in the field of business and management has developed over the years. In order to limit the number of irrelevant hits, you limit your search to two mainstream international business journals. The screenshot below shows the search and all papers receiving more than 300 citations. The most cited paper – by a large distance – is Kogut & Singh’s paper on the effect of national culture on the choice of entry mode. This was a seminal paper in that it introduced culture as a variable to be considered in studies on entry modes. Entry modes concern the way MNCs enter foreign countries and could include acquisitions and joint ventures. Other highly cited papers are those providing reviews of the field (e.g. Adler, Hofstede, and Leung et al.). However, the general study of the impact of culture on managerial work values and practices is also popular (Newman & Nollen; Ralston et al.). Further highly cited papers deal with the impact of culture on specific topics such as corruption (Husted), strategy (Hennart & Larimo), entrepreneurship (Thomas & Mueller), compensation practices (Schuler & Rogovsky), and business negotiations (Graham). When I sort the articles by year, I find the interest in the role of culture to be increasing. There were only six articles published in the 1980s that had culture in their title. Likewise, in the first half of the nineties, only five articles dealt with culture to such an extent that they included the word in their title. In the latter half of the nineties, the number of articles published on culture increased to nearly a dozen. The first decade of the 21st century produced some 40 articles on culture, with another 40 published in the next five years. It is clear that culture is a topic that is of sustained interest to international business scholars! However, I am also interested in how the volume of research on HIV has developed over the years. In order to assess this, I rerun the search for a single journal: Science. The reason for this is that if I include all journals only the most highly cited 1000 results will be shown and this will naturally include fewer recent articles. Splitting a search into two to include all papers: Running the search for Science alone, splitting it in into two time periods (before and after 1996) and aggregating both searches into one ensures I also include less-cited articles (there are 100+ articles without citations in both periods). This reduces the risk of missing most of the recently published articles. Number of publications on HIV peak in 1988: When I sort the results by year, I find that articles on HIV started to be published in Science in 1986. However, after removing duplicates, I found only four articles published in that year. About a dozen articles were published in 1987, whilst nearly 50 articles were published in 1988. This was one of the years with the largest number of publications on HIV in Science. Another peak in publications in 1996: Between 1989 and 1995 the number of articles had gone down to about 20-30. However, in 1996 the number of articles reached nearly 50 again, dropping to around 30 again in 1997-1999. From the early 2000s, the number of articles published on HIV in Science went down to about 15 a year, with a seeming resurgence from 2013 onwards where we see a return to 25-30 articles a year. Publication peaks follow major medical developments: The name HIV was introduced in May 1986 by the International Committee on the Taxonomy of Viruses. The current treatment for HIV was introduced in 1996, resulting in a declining number of deaths from HIV/AIDS. Studying the scientific interest in HIV (or any illness) thus allows one to understand the development of interest in the disease over time. The new Publish or Perish version 5 allows for searching Microsoft Academic as a data-source. This provides you with several features that make doing a literature review even easier.